When a family member of close loved one passes away, the weeks – even months – that follow are filled with grieving and a variety of other heightened emotions. For the person named as the Executor of the estate in the decedent’s Last Will and Testament, or who volunteers to be the Administrator if the decedent left behind an intestate estate, those months must be spent focusing on the legal aspects of the decedent’s death. If you find yourself the Executor or Administrator of an estate, and you have never served in that role before, the prospect of fulfilling that role now may seem a bit daunting. To help you get started, the Lincolnshire, Illinois estate planning attorney at Hedeker Law, Ltd. have compiled some basic probate resources that you may find helpful. If you have specific questions or concerns about the estate you are probating, please do not hesitate to contact our office to schedule a consultation. Authenticating the decedent’s Last Will and Testament and allowing interest parties the opportunity to challenge the Will. Identifying, locating, valuing estate assets. Notifying creditors that probate is underway and offering them an opportunity to file a claim against the estate. Ensuring that all state and federal taxes owed by the estate are paid. The individual who oversees the probate of an estate is the Executor and is appointed by the decedent if a Last Will and Testament was executed prior to death. If the decedent died intestate, or without executing a Will prior to death, any competent adult may volunteer to be the “Administrator” and oversee the probate of the estate. With few exceptions, the job of Executor and Administrator are the same, the primary difference being whether the individual was appointed or volunteered for the position. For a general overview of the probate process, you may wish to read the section entitled “The Probate Process” found on the American Bar Association’s website. In addition, the Lake County Probate Court offers an overview entitled “Decedent’s Estate” and they have published a booklet entitled “Probate Court” that is full of useful information. Typically, the probate of an estate must take place in the county in which the decedent was a resident at the time of death. If your loved one was a resident of Lincolnshire, Illinois, that means the probate process will take place in the Lake County Court system. Given the legal and financial experience that is often necessary to successfully oversee the probate of an estate, most Executors/Administrators retain the services of an experienced estate planning attorney to assist them throughout the probate of the estate. If, however, you decide to proceed pro se (as a self-represented litigant), there are some resources available to you that may be helpful. The Lake County Court system has a Center for Self-Represented Litigants that you will find useful. The Southern Illinois School of Law also has a Self Help Legal Center that may be of use to you. The Lake County Forms Center will have most of the forms you will need; however, it is important to note that the court staff cannot help you fill out the forms nor can they answer legal questions. If you decide to retain an attorney to assist you, you might start with the American Academy of Estate Planning Attorneys website. The AAEPA is a national organization of attorneys who have chosen to focus their practice on legal issues related to wills, trusts, and estates. Membership in the AAEPA signifies that an attorney has proven experience in the areas of estate planning and/or elder law. The Illinois State Bar Association’s “Illinois Lawyer Finder” section is another good resource, as is the Lake County Bar Associations’ Lawyer Referral Service, for locating an experienced estate planning attorney to help you. As the Executor/Administrator of the estate, you will need to obtain several certified copies of the decedent’s death certificate. In the State of Illinois, you may obtain certified death certificates online using VitalCheck’s website. As the Executor/Administrator of the estate you will also need to identify and secure all assets owned by the decedent. The Lake County Recorder of Deeds is a good place to start your search for any real property owned by the decedent at the time of death. You will also need to notify all creditors of the estate that probate is underway. To ensure that unknown creditors also have a chance to file a claim, you will need to publish notice of the probate of the estate in a local newspaper. The Lake County Journal is one option for fulfilling your notice requirement to creditors. One of the most important responsibilities of the Executor/Administrator is to ensure that any tax obligation is recognized and paid before any estate assets are transferred out of the estate. Every estate is potentially subject to federal gift and estate taxes. As the Executor/Administrator of the estate you must prepare an estate tax return and determine if the estate owes any federal taxes. The Internal Revenue Service (IRS) website offers a general overview of the federal estate tax. They also have a “Frequently Asked Questions about Estate Tax” section that may be helpful. The State of Illinois also imposes a state level estate tax. Information on the tax can be found on the Illinois Attorney General’s website. 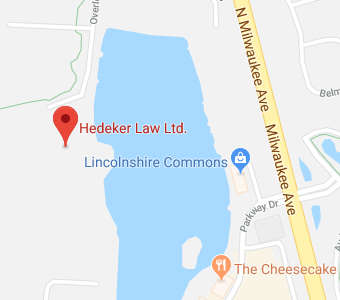 If you have additional questions or concerns regarding the probate of an estate, contact the Lincolnshire, Illinois estate planning attorneys at Hedeker Law, Ltd. by calling (847) 913-5415 to schedule your consultation.